You did your PhD at Stanford University – do you find different cultures of ‘open’ and differences in implementation between there and UCL? To be completely honest, the Open Science conversation was conspicuous by its absence for most of my time at Stanford – at least within the Medical School, which housed both my lab and department. Rather than implying an ideological opposition to “openness”, I think this provides a fairly good example of how insulated parts of Stanford could be from debates raging in the wider world of science. At least in mid-2015, when I started my postdoc, UCL appeared far more engaged as an institution with the issues surrounding public access to scientific research. You recently created an awesome collection on Evolutionary Cell Biology at ScienceOpen (thanks!) What was your motivation behind this, and what do you hope to achieve? Thank you for the opportunity! I think your ‘collections’ model holds huge promise, especially at a time when the flood of research papers (and preprints!) makes it almost impossible to stay current, even in your own field. Until the machines take over, careful human curation is the key to extracting a coherent narrative from the literature – a form of curation that, at least in my field, has traditionally been the domain of paywalled review journals that invite senior scientists to pen reviews. The collections model gives a much broader swathe of researchers the tools to curate the literature and make the results accessible to all. The collections model gives a much broader swathe of researchers the tools to curate the literature and make the results accessible to all. On a personal level, kickstarting this collection was a thought-provoking exercise and a great way for me to develop my own narrative of a growing and very dynamic field. I hope to eventually recruit more colleagues to join me in editing the collection! I also think putting together a collection could serve as an excellent teaching exercise in graduate education, something we hope to explore with the MSc and 1st year PhD students at our institute in the near future. Models that explicitly separate the act of publishing from peer review hold the most appeal for me. These allow the data to be shared immediately with other researchers and the public (via preprint servers or platforms for post-publication review), removing journal-based constraints on the publishing process while still preserving the benefits of peer review. Having said that, there are obvious roadblocks to implementing such models, without correspondingly obvious solutions (at least to me). In my field, many scientists only volunteer their time to review papers because they trust the journal that requested their help. How would one ensure that all manuscripts are reviewed properly? If you rely on the authors to identify their own reviewers, how can you ensure truly impartial peer review? If the authors do not comply with post-publication review, would there be a penalty? In a “flat” publishing world, how do you assess impact? And so on. Perhaps some of these issues could be solved with incentive structures that would require academics to demonstrate a track record of responsible, thoughtful peer review – including postdocs! Other issues could perhaps be solved by envisaging a new role for journals in identifying and highlighting the best papers after publication. I clearly don’t have all (or any!) of the answers but I’m excited that the conversation is gathering momentum. While the community resolves some of these issues, I’m a strong proponent of the “beer and tacos” or “have your cake and eat it too” approach: deposit research in a preprint server and submit it to a (preferably Open Access) journal at the same time. Even for early career researchers in the biomedical sciences, this is a positive move towards publishing reform with little attendant risk – and it isn’t enough for only the senior academics to make noises about changing the system. I’m a strong proponent of the “beer and tacos” or “have your cake and eat it too” approach: deposit research in a preprint server and submit it to a (preferably Open Access) journal at the same time. As a postdoc, do you feel like you have a voice in ongoing debates around open science, and in particular research[er] assessment? How important do you think it is for early career researchers and students to be vocal in these debates? Do you think they’re more at potential risk than more senior researchers? This is an issue quite close to my heart! I feel very strongly that early career researchers (ECRs; in practice, postdocs, early career fellows and perhaps senior PhD students) need to have a much louder voice in debates around the future of the scientific system that we are poised to inherit. However, very few postdocs embrace their status as real stakeholders, which is hardly surprising since we are often told to focus only on our research and publishing high-impact papers. While we are, indeed, far more vulnerable than senior researchers, there is safety in numbers! I am seeing more and more examples of postdocs coming together – such as the Future of Research folks in the US – to debate issues around open science and researcher assessment, with a very real impact on policy. 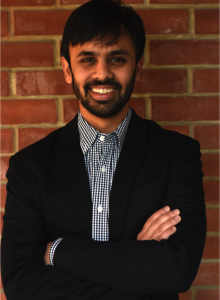 Gautam is a Marie Sklodowska-Curie Fellow at the MRC Lab for Molecular Cell Biology, UCL. He works with Buzz Baum on the evolution of eukaryotic cell division machinery from archaeal precursors, using fission yeast and thermophilic archaea as model organisms. Gautam received his PhD in Systems Biology from Stanford University in 2015.